Let me start by saying, this was the very first home my wife and I ever purchased. We have been dreaming and looking for a few years. After moving back to N.C. we put our hopes in the hands of Katrina and David at Hunter Rowe. Little did we know how close we were to being able to purchase a home, a place of our own and somewhere safe and fun to watch our girls grow. After sitting down with both Katrina and David, we were given the phone number to our next miracle worker, Edwin Hall, of Angel Oak Home Loans. He worked his magic with the VA and was able to secure us the money we needed to purchase our dream home. Serving in the U.S. Navy, moving from town to town or state to state, didn’t leave us a lot of time to put down roots. 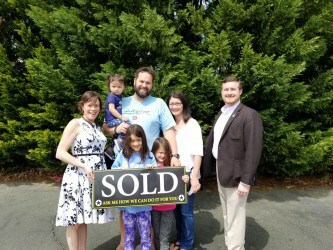 Thankfully Katrina, David and Ed were there step by step, and we closed on our dream home within thirty days. I can proudly say I love coming home every day and seeing our house. Our girls have said more times than I can count “How much they love our home.” We are truly blessed, in a gorgeous Cape style house, with a big backyard and great neighbors in an excellent neighborhood. If you are considering purchasing or selling a home, please take my advice and reach out to these wonderful folks. Thank you Katrina Shankles, David Malone and Edwin Hall for making our family’s dream come true.